The regular season has concluded, and for all intents and purposes, the on-field portion of any draft evaluation has all but concluded for the 2019 class. This is a mock draft different than ours from September and October, and rather of what I believe will happen next April, not what I would do. Since the draft order isn’t even close to set, I’m not going to insult your intelligence by even trying to project possible trades at this point. While the 49ers have used first-round picks along their defensive line in three of the last four seasons, those are sunk costs at this point. 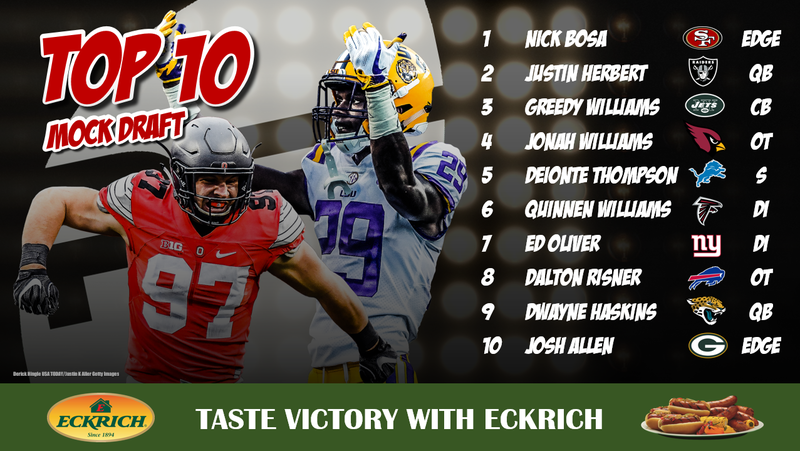 They’d be overthinking it to go anywhere other than the best player available, and that’s Nick Bosa. The Ohio State edge defender has led all FBS defensive linemen in pass-rush win rate each of the past two seasons. Every move head coach Jon Gruden has made since taking over in Oakland suggests he has no ties to quarterback Derek Carr. If Gruden likes what he sees from Herbert — and there is a lot to like — he has more than enough draft capital to do whatever it takes to go get him. Ever since he saw his first snap of college football back in 2017, Williams has been lights out. His career passer rating against is a stingy 43.0. Standing 6-foot-3, Williams has the length teams will covet highly. This is the perfect combination of need, positional value and talent. Arizona’s line ranked last in our latest offensive line rankings and could use any position up front. Williams has allowed all of nine pressures this season and no sacks on 396 pass-blocking dropbacks. The Lions simply need an influx of talent in the secondary and Thompson has plenty of that. He makes plays from the middle of the field that college safeties aren’t supposed to make. He’s allowed a passer rating of 54.0 on his 30 targets this season. Call him a one-year wonder if you want but Williams’ one season is as good as we’ve ever graded for college interior defensive linemen. In fact, his 95.8 overall grade would be the highest single-season grade we’ve ever given to a defensive interior player. He’s shown he can stop the run and rush the passer from any alignment on the ‘Bama front. Odds are Oliver’s potential is still going to win out with NFL GM’s. You simply can’t teach 280-plus pound men to move the way he does. That being said, he still has a ways to go as a pass-rusher. His 88.4 pass-rushing grade is only fifth in the country among interior players despite facing lesser competition in the AAC. Three years ago it was Jack Conklin. Two years ago it was Ryan Ramczyk. Last year it was Frank Ragnow. This year it’s Dalton Risner. All offensive linemen who aren’t necessarily receiving immense draft hype, but have crushed the PFF grading system at every turn of their college careers. Risner allowed only 28 pressures on 1,489 pass-blocking snaps in his college career and could step in and start immediately at right tackle for the Bills. While there’s a chance that quarterbacks like Teddy Bridgewater, Jameis Winston and Derek Carr are available this offseason, the Jaguars will be hard pressed to make a serious play at any of them with their cap situation. 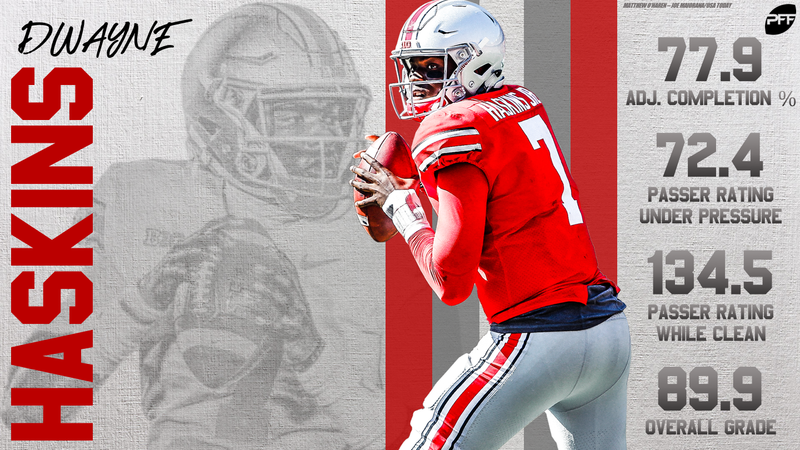 Insert Haskins who has flashed high-level quarterback traits in his only season as a starter at Ohio State. His 134.4 passer rating when kept clean is the second best in the nation. Yet another edge defender who improved mightily over the offseason. He went from being listed at 230 pounds last season 252 this year and the result is our highest-graded edge defender in college football. His skill set will appeal to teams that ask their edge players to drop in coverage as he’s been impressive in that aspect as well with an 82.1 coverage grade. After taking Denzel Ward last year, the Browns go back to the well to build a budding, young secondary. Listed at 5-foot-11, 175 pounds Murphy doesn’t have near the size of a corner like Greedy Williams, but he makes up for it with athleticism and ball skills. Murphy is the highest-graded corner in the country (91.2) and has 13 combined pass breakups and interceptions. While Florida State went backward this year, Burns took a big jump forwards. The junior filled out his lengthy frame over the offseason and that increased strength has paid off big dividends as a pass-rusher. His 69 total pressures are the most in the country. I’m no proponent of drafting solely for need, but it’s not a hot take to say the Bengals have the worst linebacking corps in the NFL. White would immediately be the most explosive linebacker on the Bengals roster and his 90.7 coverage grade this season would be a welcome addition. Jason Peters will be 37 years old by the start of next season. With his play slipping and uncertain health, Peters’ left tackle spot should be addressed sooner rather than later to keep Carson Wentz upright. Little allowed all of 10 pressures on 465 pass-blocking snaps this season. The Dolphins simply haven’t been able to replace the disruption the Ndamukong Suh brought to the table. Wilkins isn’t quite Suh, but he’s freakish in his own regard. His 92.6 overall grade this season is third-best among all defensive linemen. The Colts need any sort of help they can get at cornerback. Their highest-graded corner this season, Pierre Desir, is a free agent at year’s end. 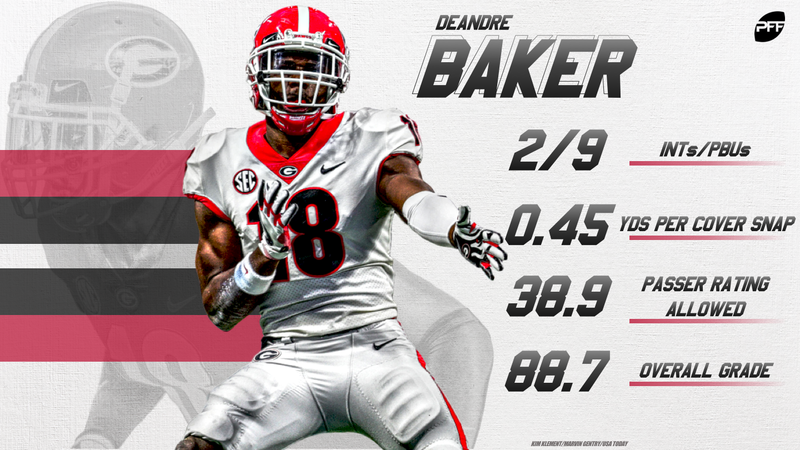 Baker is a physical corner who ranks second among Power-5 cornerbacks with a 29.8% forced incompletion rate. At 6-foot-4, 265 pounds, Ferrell certainly looks the part of a 4-3 defensive end in the NFL. The concern is that even with that ideal build, he’s never quite dominated at the college level. His 84.7 overall grade this year as a redshirt junior is a career high. While Brian Burns and Josh Allen moved way up from most preseason draft boards, you’d have been hard-pressed to find anyone who had Polite ranked in the preseason. The junior had played 451 non-descript snaps his first two seasons at Florida before bursting onto the scene this fall. In 479 snaps already this season, he’s almost doubled his pressures (38 vs 21) from his first two years. While the Broncos are set at edge for the foreseeable future, the interior of their defensive line has slipped mightily from their Super Bowl peak. Lawrence is the rare do-it-all nose tackle that will help pad Von Miller’s sack totals. The redshirt sophomore is no sure thing to declare, but if he does, he’s the most impressive interior lineman in the class. Biadasz is the highest-graded center in the country after finishing fourth a season ago. He has the skill set to play any of the interior line positions for the Vikings. 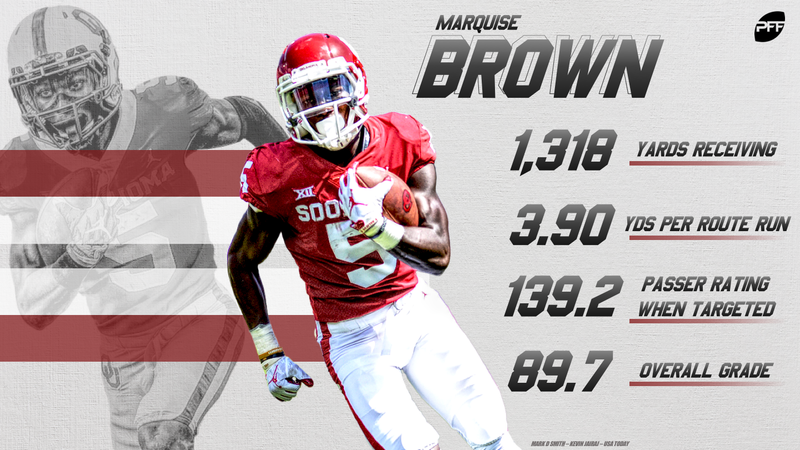 The value of speed continues to grow with modern NFL offenses and Brown possesses as much of it as almost anyone in this class. Brown’s 592 deep receiving yards are the fifth most in the country. Bush plays like he’s shot out of a cannon and has consistently been among the most physical linebackers in the country during his tenure with the Wolverines. His 13 sacks the last two seasons are the most of any Power-5 off-ball linebacker. The Raiders front seven could use talent wherever they can get it. Gary is raw as can be and disappears too often. He was held pressureless on 26 pass-rushes in their critical loss to Ohio State. The physical tools though still pop off the tape regularly. Few teams have a better track record of developing pass-rushers than John Harbaugh’s Ravens so if anyone can maximize Gary’s potential, it’s them. Ideally one of either Devin White or Devin Bush falls to Pittsburgh here, but adding another athletic pass-catcher like Fant is a solid consolation prize. Over the past two seasons, 18 of his 69 catches have resulted in touchdowns. Malik McDowell was supposed to be the answer at 3-tech before his career was cut short and the Seahawks haven’t found a replacement since. The 6-foot-7 Tillery is a dominant physical specimen who is already developed as a pass-rusher. His 17.0% win rate as a pass-rusher is second among interior defensive linemen in college football this season. Metcalf is one of the most intriguing receiver prospects in some time. His physical tools are off the charts, but it never quite turned into dominant production at Ole Miss. The Raiders have enough draft capital to take chances on high ‘upside’ guys like Metcalf and hope they pan out. Offensive tackle talent goes quickly in the NFL draft, and even though Cajuste has some question marks, odds are he still sneaks into Round 1. What is no question, is how big of a need it is for the Texans. Their tackles have combined to allow the most pressures of any pairing in the NFL. Simmons has top-10 type talent, but it’s likely some teams won’t even have the defensive tackle on their boards altogether stemming from a 2016 video of him punching a woman. On the field, he’d shore up the leaky interior of the Chargers defense. Simmons has been a top-five graded interior defensive linemen this year and last. The Pats nab their QB of the future. Grier has his issues, but he has NFL-level accuracy that can be molded over time. His 75.9 adjusted completion percentage is 11th best in the country. They say that 230-pound receivers aren’t supposed to be as shifty as the Ole Miss junior. The Packers have coveted yards after the catch from their wideouts over the years, and few do it better than Brown. His 40 broken tackles over the past two seasons are the third most among all wideouts. The other LSU corner. If he wouldn’t have missed the better part of his career in Baton Rouge because of a suspension related to cheating on a drug test, Fulton may be getting talked about in the same light as the aforementioned Greedy. He allowed 17 catches on 42 targets all season for 222 yards. It’s alright, you can say ‘who?’ If you haven’t heard of the Old Dominion edge defender though, you’ll start to more and more in the coming months despite our best efforts at showcasing his ability all season long here. The senior has improved every single year of his career before finishing 2018 with a 91.6 overall grade. He already has a myriad of pass-rushing moves and seemingly won every time he got a one-on-one this past year.